4 Ways to Stay Happy and Avoid Being Down! One thing that seems to happen with somewhat normal regularity, is a customer who is on a cost per print contract unfortunately runs out of toner and then needs it asap. Some of this is probably our fault. We need to communicate better and let clients know they can have a set of toners and supplies on the shelf so people don’t run out. A small backup – For a company who has mission critical printing, it is nice if there is a small backup on-site. No copier works 100% percent of the time. If a part is on back-order it can make copying impossible for a day or two. We do have loaner devices for our local clients when required, but it would be easier if there was a $200 unit on site for the once a year issue or if #1 was inadvertently ignored. The client would use the software to place a service call rather than call Xerox or us. It is WAY faster for the client. Waiting for Xerox can be like death from 1000 cuts. The software skips all that and puts the ticket at the front of the queue. If there is uncertainty, call us – sometimes there is a new employee. Sometimes people forget. We don’t want people to be down, so we always welcome a phone call. We want to hear from our clients and never believe it is a hassle to talk to a client. Clients pay our bills. They are critical. We want to honor that. 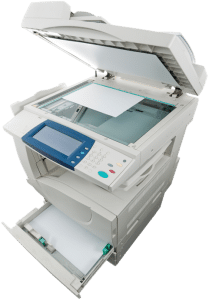 If you are on a program with us, it is good to check your toner levels and make sure the person who deals with the copier the most knows how to use the software to order supplies or service. If all else fails, call! We want our customers to be super happy. If you are not super happy, let’s fix it. Most issues and service calls will be avoided by simply doing #1 above (at least 70% of issues happen here). We know our clients are busy and want to help all this be automated so you can focus on your business and never be down!